Leisa Berlin is the Chair of this year’s Beebe Ball. 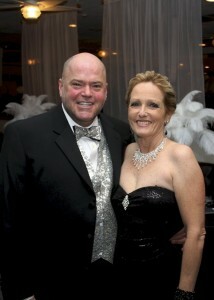 Here, she is pictured with Co-Chair Drexel Davison, attending last year’s Ball. Tickets are selling fast for Beebe Medical Foundation’s 25th Annual Beebe Ball to take place from 6 p.m. to 11 p.m. Saturday, November 3, 2012, at the Baycenter in Dewey Beach. The theme of this year’s event is the Silver Soirée, and guests are encouraged to wear silver, white and/or black tie. Valet parking will be available for all guests as the Baycenter’s parking lot is currently under construction. The funds raised at this year’s Ball, the Silver Anniversary, will be used to expand the care of persons with heart rhythm disorders. The will include the purchase of new equipment that will allow Beebe Medical Center to provide cardiac electrophysiology studies, which record the electrical activities of the heart. This expansion of electrophysiology cardiac services will allow Beebe Medical Center to continue to grow its cardiac program. These services and treatments can improve patients’ quality of life and overall health. The East Coast’s celebrated “Big City Band” will be on stage again, keeping guests on the dance floor all evening. This year’s silent auction will feature fabulous gift certificates and items donated by local businesses. One live auction piece to be featured this year was created specifically to commemorate the 25th Anniversary of the event. Harry K of Atlantic Jewelry has offered an exclusively designed, limited edition pendant in 14k white, rose, and yellow gold, encrusted with blue, natural yellow and white diamonds. A filigree design is entwined throughout the piece. If you look through the piece, your eyes will catch the sparkle of the diamonds peeking through the filigree. The reverse side is engraved with the Harry K logo and signature diamond, and an inscription of the number of the piece. The event will also feature a raffle drawing for a one-week trip to Italy. The lucky winner will spend three nights in Florence and four nights in Rome. Tickets are $50 each and only 250 will be sold. Participants do not need to be present for the drawing to win. Silver Soirée tickets, starting at $200 per person, and Italy raffle tickets can be ordered by mail, online or by calling the Foundation at (302) 644-2900. Beebe Medical Foundation was established in 1989 with the sole mission to raise philanthropic support for Beebe Medical Center. The Foundation is located at 902 Savannah Road, Lewes DE 19958. Please visit us online at www.beebefoundation.org.